Christmas is just around the corner…this year went too fast wouldn’t you say?! You may already be thinking ahead for Christmas gift shopping?? Here is the perfect opportunity to purchase something AH-MAZING from Best Buy. From electronics and appliances to cool gadgets and movies, Best Buy has a HUGE assortment of things to choose from. Giveaway is open to US & Canada Residents (where not prohibited), ages 18+ years of age (limited to one entrant per household). Welcome to the JJMG Stackable Storage Box 2 pack giveaway. If you haven’t read about them you can do so here. One winner will win this 2 pack of collapsible, stackable storage boxes. They are so cute! We reserve the right to make revisions, to cancel, or suspend this contest for any reason. We are not associated with any of the companies named above. The odds of winning are based on the number of entries received Open US Only only and must be 18 years or older to enter. Confirmed Winner(s) (by Random.org) will be contacted by email. Winner(s) have 24 hours to respond before a new winner is chosen. No purchase necessary. Void where prohibited by law. The sponsor(s) will be responsible for product shipment to winner(s) of this giveaway. What U Talking Bout Willis? (and any other blog participating) is not responsible for product shipment/delivery. This event is in no way administered, sponsored, or endorsed by, or associated with, Facebook and/or Twitter, Google, Pinterest. This disclosure is done in accordance with the Federal Trade Commission 10 CFR, Part 255 Guides Concerning the Use of Endorsements. Entrants must only enter with either one email address, IP address and/or Facebook account, anyone found violating these rules will be disqualified. **Sponsored post – though all opinions are those of the writer and events are actual. I truly hate car shopping and when I was in a position of having to find a car fast as our other car had been totaled from an accident as a result of an act of God (how insurance determines certain types of accidents) – I turned to the internet. In doing so, I saved a lot of money through online negotiating. That was 10 years ago. Here I am now in a position of wanting/needing a newer vehicle – one that has low mileage, isn’t an all wheel drive vehicle, is a small SUV (I think), and good on gas. I must like the back end of the vehicle and the interior can’t be tan. I know this might be a lot to ask for, but I’m confident I will eventually find the right vehicle for me. I exhausted all the local dealership sites in my area looking for a used vehicle and decided I’d try searching Google. I came across cars.com. I took a chance to see what they could offer me for inventory – thinking this site isn’t local, so what would I really find. Guess what? I was pleasantly surprised! I found local places that I hadn’t searched that had inventory and a whole lot more that I’ve found to be valuable resources. Resources like – the ability to review a vehicle, finding service and repair information – even for those DIY’ers, safety and recall information, information on car seat safety and safety dangers of vehicles, estimating an auto payment using the Auto Payment Calculator, and so much more. Ironically, this week is Car Seat Safety week and thought it would be worth sharing this information that cars.com brings to consumers. They are committed to doing car seat checks so that one is informed how well a vehicle stands up to keeping children safe. Seriously, I really don’t get into all these – this is “such and such day, week, or month” but I do feel this IS one of the most important causes one could “label a week” as being. Back 50/60 years ago, car seats were so different than they are today….but then, so were cars and the size of the population. The style of cars, car seats as well as the laws on car seats, have evolved – though some cars are much safer at keeping a child safe in a car seat than other vehicles. Not only do parents need to think about car seat safety – so do grandparents, or any other family member, friend or babysitter who is putting a car seat in their car. Car seat safety really IS that important…and it pays to be informed. Though I didn’t find the vehicle I’m looking for in my locale with the specifications I’m looking for – I will keep checking back on the site. I will also use this site as a resource in getting information on a vehicle I’m interested in, no matter what site/dealership I find my dream vehicle at. There’s nothing like climbing into a freshly made bed and watching some TV. FCS will be holding a giveaway just like this in about one month. We’ve got the PeachSkinSheets in hand, all we need to do is get them on the bed and write you an honest review. Keep a look out for our review and giveaway! Be sure and read Kristin’s at It’s Free at Last full review here to learn more about these luxuriously soft, moisture-wicking sheets! Several Gorgeous Relaxing Colors to choose from! PeachSkinSheets offers: Classic White, Beach Blue, Cotton Candy Pink, Brushed Silver, Graphite gray, Mint Julep, Mariner Blue, Eggplant, Chocolate, Harvest Gold, Sage Green, Light Mocha, Midnight Black, Almond Ivory, and Deep Crimson Red. Give Their Free Swatch Program a Try! If you are undecided on which color is best for you, give their FREE Swatch Program a try! You can feel the velvety softness and quality of the fabric, while being assured of your color choice. Go ahead and order your free swatches today! Want a chance to win a set of these amazingly soft sheets? Of course you do, right? So, let’s get on to it! PeachSkinSheets in their choice of color and size! Giveaway ends 7/15/17 at 11:59 pm ET! Open to US residents 18+ and older. ***Finger Click Saver is not responsible for prize shipment. FCS is solely helping to promote this wonderful giveaway with no compensation what-so-ever. This giveaway is not endorsed or associated with any social media including Facebook, Twitter, Pinterest, Instagram or any of the like. Should you need assistance, FCS will do whatever can be done to assist you. It’s Free at Last and Mom Does Reviews are excited to share this fun giveaway with you! The giveaway is a fun celebration of Twitter Milestones: 150k for It’s Free At last and 85K for Mom Does Reviews! ***Finger Click Saver is not responsible for prize shipment. This giveaway is not associated with any social media including, Pinterest, Twitter, Facebook, Instagram, Snapchat or any of the like. ** An FCS team member was compensated for this post. This post contains affiliate links and an FCS team member may be compensated if you make a purchase after clicking on the links. Vacations, Softball, Baseball, Bowling, Charities, Graduations, Reunions – all good reasons to want to Customize at CustomInk. Shirts aren’t all you can customize. One can customize bags, outerwear, tech supplies, drinkware and koozies, pens, chairs, uniforms, blankets, umbrellas, stickers, magnets, ornaments and the list goes ON. CustomInk has made it easy for you. Check out the links below for tips and ideas. 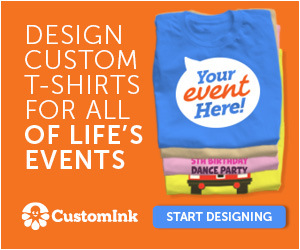 Check out all of CustomInk’s family reunion ideas and start designing your shirts today! Order Together, Pay Separately with CustomInk’s New Group Order Forms! 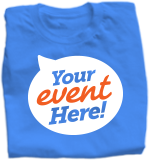 Start designing your custom t-shirts today! The possibilities are endless in customizing what you’re in need of. Dream! Customize! Make it special! Shop now. Weather storms have always driven Ann Arbor crazy with their raging rain showers, thus causing poorly maintained houses to lose a few shingles every now and then in response. Escaping the spell of rain and tough weather storms such as raging blizzards in winter or nasty breezy winds and hail might seem difficult for weak shingles of your damaged roof in Ann Arbor, Michigan. While you’re stranded in the confinement of your living room with pots and buckets to contain the leaking water from your roof, it will be quite relieving for you to know that you can have it repaired with the best roofing services from the finest roofing contractors in Ann Arbor, Michigan. Choosing from a variety of roofing contractors can be a tiring conquest, and if you have no idea of your roofing estimates or the services you are in dire need of, the hunt of roofing contractors can be a major let-down. In order to avoid this, we recommend you to get acquainted with Get Roof Pros and their fully functional website for roofing details, knowledge and services in Ann Arbor, Michigan. Get Roof Pros has made it possible for you to understand the differences in residential and commercial roofing in every possible way through their services and roofing details. On the other hand, Get Roof Pros has also made it possible for you to attain some of the best roofing services at the hands of Ann Arbor’s finest roofing contractors. In order to prevent yourself from a major injury due to a terrible fall by walking or climbing a thoroughly damaged roof, we bring the knowledge of A2 Roofing Contractors and their highly appreciable roofing services to you. A2 Roofing Contractors help you to get acquainted with free roofing estimates and their foolproof ‘no leak’ guarantee for better trust, and therefore, astounding results. A2 Roofing Contractors in Ann Arbor, Michigan deals in a variety of roofing services such as Tile Roofing, Shingle Roofing, Flat Roofing, Metal Roofing, Roof Shoveling and various others related to roof maintenance, inspection and repairs. Ann Arbor Remodeling Contractor is probably one of the most impeccable and commendable roofing contractors in Ann Arbor, Michigan. Specialized in home improvement services, Ann Arbor Remodeling Contractor not only offers roofing repairs for maintenance, but also offers brand new roof installation services amidst utmost satisfactory results. With elegant remodeling services, Ann Arbor Remodeling Contractor vows to provide your home with services that would leave it brimming with safety and security. With the best roofing materials to choose from, Ann Arbor Remodeling Contractor also provides you with free roofing estimates as per your choice, requirements and housing standards. These 3 roofing contractors in Ann Arbor, Michigan are probably the best and pros in reaching out with services that can spruce your damaged roof adequately enough. Choose from the best and be wise in your choices.